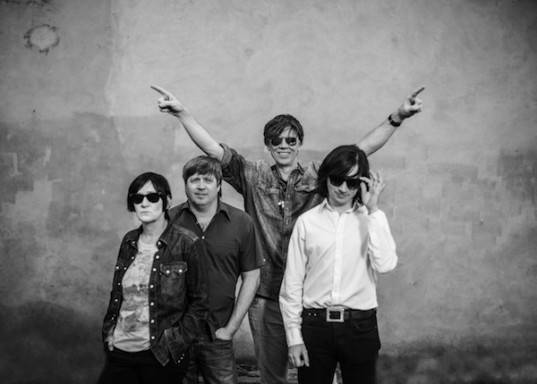 Thurston Moore and band. Phil Sharp photo. The disbanding of Sonic Youth in 2012 was a tremendous blow to the indie world. The band’s unexpected breakup followed the end of bassist Kim Gordon and frontman Thurston Moore’s 28-year marriage. It was unimaginable that the group that gave us the groundbreaking records Daydream Nation (1988) and Goo (1990), and whose influence sprouted countless experimental noise bands over 30 years, would cease to exist. But the end of one era has led to new stages in each band members’ careers. Guitarist Lee Ranaldo has been writing music with The Dust, alongside SY alum Steve Shelley (on drums). Gordon has been working on various fine art projects in New York, is currently writing a memoir and performing with the band Body/Head. 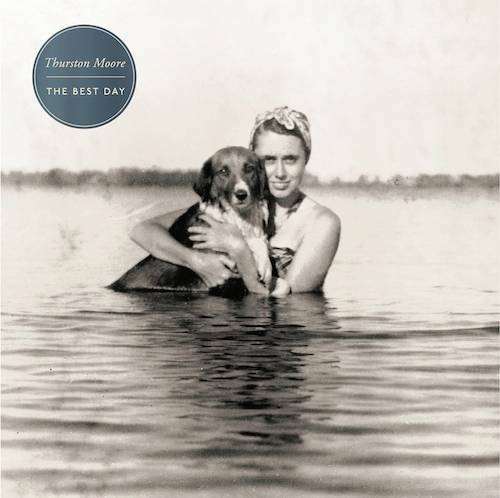 I had the opportunity to speak with Moore about his new band and the upcoming release of their record The Best Day (out on September 23rd via Matador records). They will make their way to Vancouver on October 3, with an intimate show at the Biltmore Cabaret, Moore’s second solo show in Vancouver following 2013’s appearance at the Rickshaw Theatre. What started as an eye-opening conversation about Moore’s writing process turned into a priceless music history lesson. I sat and listened in awe as, calling from his home in London, he spoke about his encounters with Jean-Michel Basquiat, Richard Edson’s instrumental role in San Francisco’s punk rock scene (as well as his famous John Hughes movie cameo), and the romantic quality of cassette tapes. As the stories poured out of the charismatic icon, it was apparent why Moore has become the most sought-after talking head amongst post-’70s rock documentarians. Although the self-appointed “nerdstorian” did admit that Henry Rollins could give him a run for his money. Ria Nevada: You’ve put together quite the supergroup for the latest record – a lineup that will have all the noise punk and shoegaze fans frothing at the mouth. How did you rally everyone together for this project? Thurston Moore: I moved to London last June, in 2013, and I was writing songs here and looking for a guitar player. I heard this guitarist playing in the flat next to mine and he was teaching students how to play Led Zeppelin guitar riffs and I thought that was kind of curious. And I met him and we started talking all about music and his favourite bands were Led Zeppelin and The Fall, which I thought was kind of a wonderful extreme combination to have. I thought he was a great guitarist – his name is James Sedwards – he has this instrumental, prog-rock group that’s really hyper, really intense. I went to see them and his guitar playing was so incredible that I called him up and asked him if he wanted to play guitar with me on these new songs. But I thought I was undervaluing him because I was basically asking him to play unison guitar with me and I was playing my stuff – and I’m not like a real traditional guitar player, my things are really strange and weird and the tunings are really different – but compared to playing Jimmy Page, it’s pretty simplistic. So, you never know. So I called her up and she said, “Yeah, I would love to do it.” So, she did it and her and Steve never really played the music until I put them in the studio and we started recording. This was just the initial batch of songs I wrote and it was really great. Once Steve and Deb started playing together, it was wonderful. It was like they just latched onto each other and created this really incredible rhythm power house. 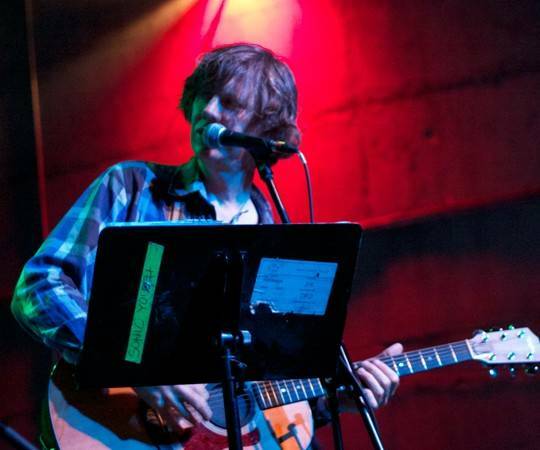 Thurston Moore at the Rickshaw Theatre, Vancouver, July 22 2011. Lorenzo Ignacio photo. RN: A few years ago, I was lucky enough to get my hands on the Mind Wars cassette that you put out with Beck. And I was listening to “Tape” on your latest record, which felt like a tribute, possibly even a lament for the cassette. TM: It’s kind of a tribute. I had done a book called Mix Tape that was published years ago and that book itself was all about getting the cover art of all these different cassette mix tapes that people would make as love letters to each other. You know, I come from a time where you’d start dating somebody and one of the coolest thing you could do was give them a mix tape with all your favourite songs on it for them to see what’s going inside your soul! (laughs) And I think people still do that with iTunes. But I think it was about the idea of ferric oxide tape having a certain sentient quality onto its own. It was definitely a song talking about things that have past and things that are gone, such as this idea of sharing through mix tapes and these kind of simple measures. And I didn’t write those lyrics, actually. They were written by this poet, Radiux Radio, who wrote three songs on the record. Great poet, local poet, transgender and wonderful. I had Radiux send me some lyrics, because there were a few songs I was working on and I had some lyrics done, but I really like Radiux’s poetry. So I asked, “Do you have any poems that I could use to possibly work into a song?” And I used three of them. One of them was “Detonation”, one was “Tape”. Her original title was “Tape Magnetique”, and I said, “That might be a little too pretentious” (laughs). I said, “Let’s just call it ‘Tape’.” There are some people who are making a documentary about cassette tape love and culture, and they might actually use that song in it. RN: I think there was this beauty in being able to catch a song on the radio then scrambling to just get a snippet of it on a tape. With discovery tools like spotify, the beauty of this spontaneity is pretty much taken away us. How do you feel about these technologies that “guess” what listeners like? I feel like it may have the effect of creating a passive listening culture. TM: I guess so – I mean, I choose to mostly ignore it. If I had the power to preference that so that it doesn’t happen I would. Maybe I do, I’m just not very technologically adept. But I have found myself looking at certain sites where I purchase something, and they say “Judged by your past purchase, we think you may enjoy these items as well,” and you can’t help but look. And I have seen things I didn’t even know existed that were kind of appealing and I’d be like, “Oh that’s cool.” But at the same time it’s a little bit creepy to have your online purchasing create some sort of profile of your interests. It makes me a little reactionary and kind of makes me want to sort of close the laptop lid and maybe throw it out the window and walk into the forest, build a hut, have a hot plate and a mattress, and write poetry for the rest of my life. Which I still may do. RN: You created these soaring soundscapes on tracks like “Grace Lake” and “Germs Burn” for The Best Day. I was at your show in Melbourne a few years ago when you were touring Demolished Thoughts, and I think I remember you speaking about how one of your songs reminded you about living in New York in the 70s and falling in love with girls in record stores. Were there specific memories or images that you drew from for this record? TM: That song was from a record called Trees Outside the Academy, and it was called “Nevermind”. No! That’s a Nirvana album! (laughs) It was called “Never Day”, and it was specifically about this memory in the ’70s living in New York by myself, being in these basement record stores. And you would fall in love. There’s lots of different things that come into play lyrically for me on this record. I’m really interested in how language works when you’re just sort of writing in any kind of poetic form, be it lyrics or just sort of straight poetry on the page where it’s visual, or it has certain line meter that adheres to some kind of tradition or history of poetry or lyric writing. Having the lines and the ideas come to you in a way that’s rhythmic and has some kind of rhyme scheme, or not, and not being too judgmental about it, and just being artful about it and having fun with it and the play of words, without any real sort of intention of being descriptive. There’s a certain magic in writing that happens with that. I find that if I think about what I want to write, nothing will come out. But if I just start writing, like the practice of it, then the ideas do formulate. And they formulate from something that’s going on in your consciousness or subconsciousness. You sort of modify it and adjust it to how the song feels best. I tend to write more romantic motifs in a way, or sometimes I try to have lines in there that have a bit of a humour with them. There’s this one song called “Forevermore” that has all these really intense lines of gothic religiosity going on and then the chorus is like, “That’s why I love you forevermore”, because of these really heavy statements. So it’s like a simple answer to all this heaviness going on. I started having fun with that balance. I tried to make this record have somewhat of a beneficent outlook to it, because I find there’s so much negative energy going on these days in the world. I wanted that something that dealt with the idea of bliss. The cover of the record is these photographs that I found of my mother in the 1940s when she was 19 or 20 years old. RN: I was wondering who that was! The woman with the dog in the water. TM: Yeah, yeah! She’s just in this wonderful state of being, you know? I just looked at it and thought, “That must have been the best day.” She was just falling in love with my father, and had this dog, and was at this lake, and was in this wonderful state of grace. So I wanted to share that. RN: I was listening to the Sonic Youth record that you put out in 1982 and reading the liner notes from your drummer at the time, Richard Edson. And he recalls the first time you played together in a basement studio and you started bleeding over his drum set from all the strumming. He wrote, “The only conclusion I can draw from this is that Thurston has been rocking the joint and bleeding for music ever since”. What were your memories of those recording sessions? TM: So I always remember that. I recognized him from bobbing around downtown. He was in some of the Mudd Club gigs, and we had mutual friends or whatever. But he was just like this kid. But I always recall seeing him down there. And then of course years later, especially after Jean-Michel passed away, everyone was like “Wow. What a trajectory that guy had in his life since then.” Some of us had this really slow burn through our lives. Then there are people like him, or people like Kurt from Nirvana who just had this really crazy, wild, two-to-three year trajectory where they just explode into the zeitgeist and then they’re gone. I think about that existence and how strange that is, but at the same time, having my own interaction with it, it’s just a weird memory. It’s a jarring memory. RN: Did you ever expect to see Richard Edson stealing the show in Ferris Bueller’s Day Off a few years after those sessions? TM: (laughs) No, I didn’t expect that! I knew that he wanted to become an actor and he was doing certain things. I don’t think I even saw Ferris Bueller’s Day Off until years after it came out. I only watched it because I knew Richard was in it and I wanted to see him. At that point, I was a little older than that movie’s demographic was (laughs), so it didn’t really appeal to me so much. I did get its appeal. RN: I didn’t realize he was in the movie, but when I was buying Sonic Youth, the cashier told me that Richard Edson was the car park attendant who takes Cameron’s car! TM: Oh yeah, he was also in Howard the Duck. He’s been in a few different films. But Ferris Bueller is his most noted role for sure! Richard’s still out there. He lives in LA, he’s a character actor, you’ll see him on different shows once in a while, like CSI-style shows. He was in New York from around 1975, working at the St. Mark’s Poetry Project – he was a writer, he was a poet. And then he went to San Francisco and was involved with the punk rock scene at the beginning there. He was in The Offs. Then he came back to New York and did writing again and then he just started writing music with different people and hanging out with that scene in the East Village, which was like Basquiat and other people, and that was his milieu. TM: Believe me, there’s more that I say no to! I get asked to do this all the time! And I do it once in a while because it’s either somebody I know, and I can’t say no to them, or it’s actually a subject matter that I’m interested in. Oh God – if I had a dollar for every time I was in one of those things, I would be living in a mansion right now. I think Henry Rollins is in more documentaries than me though. Somebody should do a tally! That would be a really wonderful, well I don’t know about wonderful, but it would be interesting to see who’s in more. (laughs) I think he was in a lot more MTV/VH1 sort of sound bites stuff. RN: That’s true. We could set up a little betting pool. RN: You’re our go-to historian, so the next time I need a fact-check, I’m calling you up. RN: Thank you so much for sharing your music and stories with us over the years and we’re looking forward to catching your show here in Vancouver in a few weeks! TM: I appreciate that Ria, thank you. Ria Nevada is a self-proclaimed pop culture junkie who can quote any early ’90s sitcom or made-for-TV movie, from Parker Lewis Can’t Lose to Frogs. This July she'll be leaving Vancouver for Australia, where she'll study for her Masters in Publishing and Communications. This entry was posted in Homepage Features, interviews and tagged Henry Rollins, Jean-Michel Basquiat, Sonic Youth, Thurston Moore. Bookmark the permalink. Thanks Robyn! He’s such a great storyteller – could have sat there listening and soaking in all his wisdom for hours! thanks for patronising and monopolizing the scene we are grateful..